I had met Michael Hoeffken from Weingut Leo Hillinger, Burgenland, Austria, recently in Vienna in Austria during the European Wine Bloggers Conference. We had agreed that next time he comes to Washington DC, he would give me a call. And he did. Together with Leo Hillinger’s US importer Klaus Wittauer, we sat down and went through a number of delicious Leo Hillinger wines. 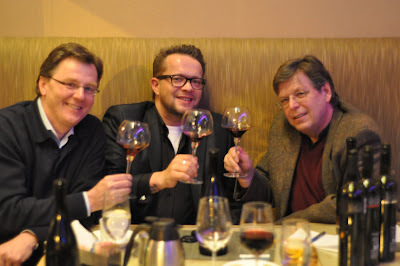 Leo Hillinger produces a range of white and red wines, but Klaus and Michael focused on Leo Hillinger’s reds this time. There are a number of important importers of Austrian wine in the US and Klaus Wittauer is one of them. Klaus and I go back many years. He was born in Austria and attended Hotel and Restaurant Management School in Salzburg. He then worked for many years in some of the world‘s top restaurants in Austria, Bermuda and the United States, including the lovely L‘Auberge Chez Francois in Great Falls, Virginia, where we first met. 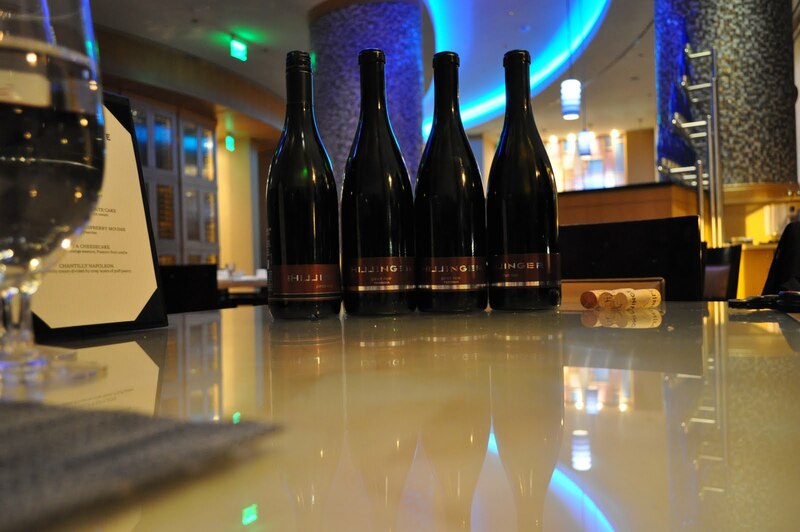 Then he moved to the wine import side and became the wine buyer for Sutton Place Gourmet in Washington DC before creating his own import company KWSELECTION with the renowned Austrian winemaker Anton Bauer about ten years ago. Today, KWSELECTION includes top producers from most of the wine producing areas of Austria: Anton Bauer from Donauland, Leo Hillinger from Burgenland, Gustav Strauss from Styria, Martin Mittelbach from Wachau, Karl & Brigitta Steininger from Kamptal, Steindorfer from Neusiedlersee, Proidl from Kremstal , Meinklang from Burgenland, Joseph Bauer from Donauland and, this his his most recent addition, Weingut Netzl from Carnuntum. As an Austrian married to an American, Klaus has a close relationship with all of his wineries in Austria and has succeed in expanding distribution throughout the United States, with a strong focus on the East Coast. Michael is an assistant winemaker at Weingut Leo Hillinger, but he is also a sales man and travels a lot in the world to promote the Leo Hillinger wines. He is a very nice, charming guy. When he is not travelling in the world or in the Leo Hillinger wine cellar, he is with his two children, he told me. Weingut Leo Hillinger is in Jois in the Neusiedlersee area in Burgenland. Burgenland is one of Austria’s 4 wine regions – Lower Austria, Styria, Burgenland and Vienna. For many years it was a bit on the margin, although it has a long wine growing tradition. Burgenland belonged to Hungary until 1921 when it was annexed to Austria post WWI. It is a melting pot of Magyar, Slavic and Austrian cultures. Many of the towns have two names, one Croatian or Hungarian and the other name Austrian. The vineyard area of Burgenland totals 14.000 hectares and comprises 4 areas: (1) Neusiedlersee: At the edges of the vast and shallow Lake Neusiedl, a variety of grapes are grown on 9.100 hectares of vineyards, including world-famous noble sweet wines. (2) Neusiedlersee-Hügelland: At the foot of the Leithagebirge and west of Lake Neusiedl, a variety of grapes are grown on 4.150 hectares of vineyards, including the renowned Ruster Ausbruch. (3) Mittelburgenland: On 2.100 hectares of vineyards, one red grape variety plays the leading role: Blaufränkisch and 4 towns are the wine-growing area´s main producers: Deutschkreutz, Horitschon, Lutzmannsburg and Neckenmarkt. (4) Südburgenland: One of Austria´s smallest wine-growing areas, where excellent terroir wines are produced from 500 hectares of vineyards, which are situated mainly on the Eisenberg, with Blaufraenkisch being the typical red wine. The Hillinger family has been producing wine for several generations. Leo Hillinger took over in 1990. At the time, the Weingut was tiny with only one hectare of vineyard area. Under Leo’s stewardship the winery has seen a phenomenal growth. Today, the vineyard area totals 46 hectares, of which 26 hectares are in Jois in the Neusiedlersee region, and another 20 hectares in and around Rust in Neusiedlersee-Huegellland. 60% of the area is planted with red varieties - Blaufränkisch, Zweigelt, St. Laurent, Pinot Noir, Cabernet Sauvignon, Merlot and Syrah - and the remaining 40% are planted with the white varieties - Welschriesling, Sauvignon Blanc and Chardonnay. In addition, grapes are sourced from contract growers with another 70 hectares of vineyards. 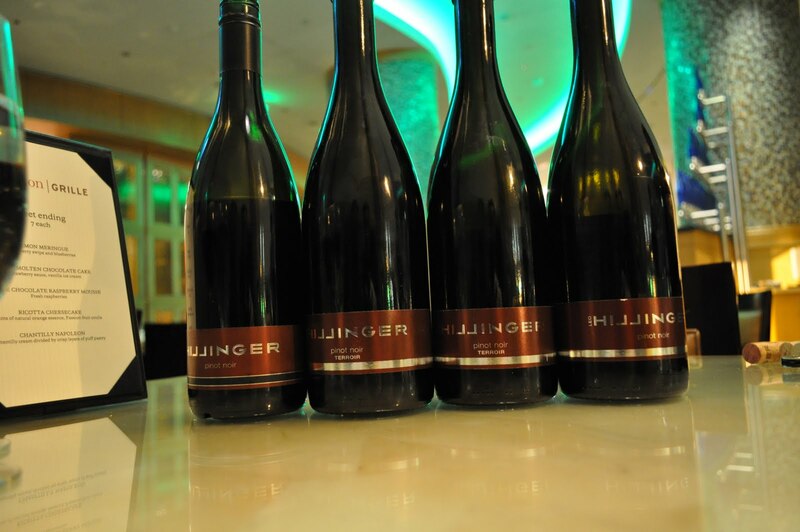 Weingut Leo Hillinger is today one of the top names in Austria. It ranks among Austria's largest producers of premium wines. More than 50% of the production is exported to 16 different countries, with the US and Switzerland in the lead. Only used oak, very silky, smooth. 13.5 % alc. US$20. This blend of Pinot Noir (25%), St. Laurent (25%) and Merlot (50%) was vinified in a steel tank and aged for 3 months in French oak. 13% alc. Michael said: “This is a wine that was created in 2004, at a time when red wines were becoming more and more oaky. Leo had no problem with that but wanted to create a wine that was different from the trend. A fresh, crisp, fruity wine. This has become our most popular red wine. It is widely available. It is served by various airlines and in the large supermarkets in Austria”. Fine, elegant nose leads to explosive dark fruit flavors with a touch of chocolate, full-bodied, soft tannins, and a lively long-lasting finish. US$15. Zweigelt is a traditional, Austrian grape variety, very popular in the country. Brilliant ruby red color with fresh cherry aromas, bouquet of sour cherry with hints of chocolate, creamy on the palate, very fruity. US$20. This is an outstanding wine. Complex nose, hints of minerals and vanilla, good structure, long and pleasing finish, a masculine wine. Michael said: “This is our best wine tonight! The wine is from the famous wine region Leitharberg, but Leo decided just to put terroir on the label instead, starting with the 2006 vintage, meaning this is our top of the line wine. From the best vineyards, the best grapes.” US$60. This wine is no longer available in the shops, but Klaus still has a couple of bottles in his private cellar and brought the bottle to the tasting. It is the same wine as the 2006 Pinot Noir Terroir, only 2 years older, but as fresh and young as the 2006. One really could see the aging potential of this wine. I would put it away for the next 10 years before opening it again. “This is my wine” said Michael. We had tasted the 2007 – Unfiltered - together in Vienna a few months ago and I had reported about it here. This is no longer called Unfiltered, but again ruby in the glass, lots of spicy aromas on the nose, good structure, ripe fruit on the palate, nice texture, smooth finish. 205 Syrah, 20% Zweigelt, 10% Merlot. US$27. Best thing about being a member of a certain wine club is that you get to explore a lot of things about wine. You get to learn about it's complexities and how you can have it the best way.